In an increasingly wireless & stressful modern day world, Nimbus helps create order out of chaos. Representing the latest generation of scientifically validated 'Active' Q-Link SRT products, Nimbus is designed to help clarify and support the users biofield by enhancing the environment in which the user works, lives and otherwise occupies. Plug Nimbus in to any USB port or hub to effortlessly & instantly generate a 30' omnidirectional radius of SRT-3 you can use to reduce the negative effects of EMF on your body and mind - and enhance your well-being, performance and quality of life. An essential companion to every workstation and perfect for larger home, office, retail environments and other spaces where others can as well benefit. Nimbus is also an ideal compliment to anyone already utilizing a wearable Q-Link SRT product. Who can benefit from Nimbus? Individuals spending any amount of time in front of a computer, office workers, students or entire classrooms, IT professionals, writers, graphic artists, business people, jet-setting laptop users, teachers, gym members and fitness facilities, and many others. Transports easily for discreet use anywhere. No software required. 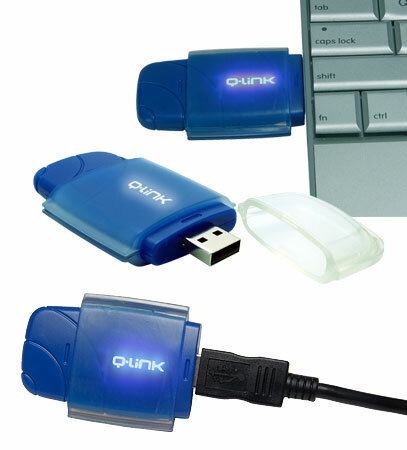 Backlit Q-Link logo indicates power-up. USB cap removes and stores on unit end while in use. Optional AC to USB wall adapter allows for discreet use anywhere beyond direct computer plug-in and more centralized placement for targeted coverage. Adapter available in the product gallery and at checkout. L: 2 7/8" X W: 1 7/8" X D: 1/2"
Compliant: Nimbus has been tested and found to comply with the limits for a class B digital device, pursuant to part 15 of the FCC Rules.